Shoreline Community College’s annual winter ball is here once again. 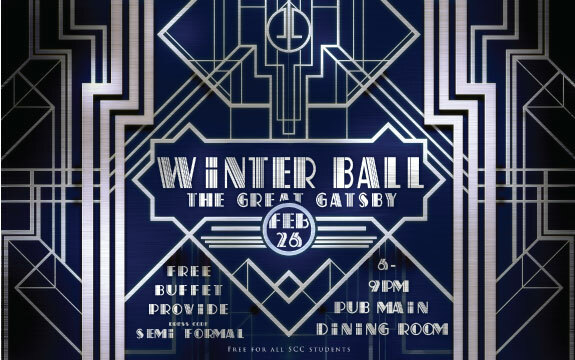 This year’s winter ball, which draws its theme from “The Great Gatsby,” includes a free sushi dinner accompanied by live Jazz music. Although there will be no entrance fee, the event is only open to SCC students. Chronos Chow, the president of the Hong Kong Student Association (HKSA) who organized the ball, said he chose the theme because he enjoyed the aesthetic of the era, as well as the extravagance and high profile of Gatsby. Keeping with the theme, the ball will be semi-formal and extravagant, and Chow is encouraging students to come in 1920s-inspired attire. The ball will be occurring on the same day and time as the University of Washington’s own dance, also sharing the Great Gatsby theme. However, those who wish to attend the UW dance must be either a plus-one for a UW student or a current UW student. For the past two years, SCC’s winter ball has also been used for fundraising for Aids Walk and Awake and Alive. However, according to Chow, because all the funding for the ball comes from clubs and student fees, there would be no proceeds to donate this year. The winter ball this year is hosted by HKSA, who will also be collaborating with Taiwanese Student Association (TSA), Chinese Culture Club (CCC), International Peer Mentors (IPM) and Asian Student Association (ASA). To compensate for the free entry, all these clubs will providing all or most of their club funds. Four of the clubs – HKSA, TSA, CCC and ASA – have donated their entire $500 yearly budget to the event to cover the cost of a photo booth, on-site security and decorations. The group has also asked for a mini grant of $2,500 to cover food expenses which will supposably feed around 180 students. The mini grant will cover the buffet from Bluefin Sushi & Seafood Buffet. There will also be a vegetarian option. The night will kick-off will be three different performances. The first will be from Steve Kim, a music professor at SCC, and his students, who will be playing jazz music while those attending the winter ball can enjoy a sit-down dinner before the dance begins. Following their performance, Just Dance Club (JDC) will be performing a dance, and this year’s talent show winner, Leo Chang, will sing and play the guitar. After the performances the dance will start and the music will be provided by a DJ. The winter ball will be from 6:00 p.m. to 9:30 p.m. on Friday, Feb. 26 in the PUB. Students must bring their student ID.